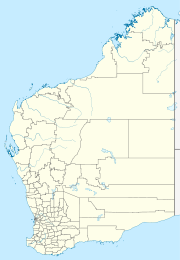 Warmun Community (also known as Turkey Creek) and Warmun are a township and locality in the Kimberley region of Western Australia, located on the Great Northern Highway, 3009 km northeast of Perth. The closest populated town is Halls Creek. The area was settled by European pastoralists in the 19th century but the community was established in 1901 when the state government built a ration depot at Turkey Creek. The Ngalangangpum School was established in town at the request of the community. Built in 1979 the school allowed students to stay in town rather than attend St Josephs school in Wyndham and only come home over the holidays. The school was significantly upgraded in 1987, then again in 1990 so secondary schooling could occur in town and upgraded again in 2001. The traditional owners of the area are the Gija peoples. The community is managed through its incorporated body, Warmun Community (Turkey Creek) Incorporated, which was incorporated under the Associations Incorporation Act, 1895-1969 (WA) in 1977. ^ Australian Bureau of Statistics (25 October 2007). "Warmun (State Suburb)". 2006 Census QuickStats. Retrieved 2010-04-12. ^ "Main Roads WA - Distance from Perth". 2009. Retrieved 2010-04-12. ^ "History of the Warmun Community". 2008. Retrieved 2010-04-12. ^ "Ngalangangpum School - Its History". 2007. Retrieved 2010-04-12. ^ "AusAnthrop Australian Aboriginal tribal database". 2005. Retrieved 2010-04-12. This page was last edited on 25 April 2018, at 06:03 (UTC).